Good fishing bait makes all the difference in how successful you'll be in catching that legendary trophy saltwater fish. Some sport fishermen may think that live bait fishing is a lot of trouble, but there's some excitement to be had if you do. After all, if you're planning on catching a big saltwater fish you have to use big bait. Catching the bait fish also takes some finessing, because it's not as easy as you'd think. If at all possible, you should also use your bait the same day for maximum effectiveness. If you can't, then the next day is best. Bait from the area you're fishing is also the best to use. If you buy bait from a bait shop, you may not be getting local fish. There's a chance that this could have an impact on the effectiveness of your bait, with the local saltwater fish you're targeting. When you're using bait fish, it's best to use live bait, or bait fish that was at worst, just recently alive. The best bait for saltwater fishing is also going to be a species that your target fish actually eats. Fortunately there are certain bait fish that are all purpose. They make excellent bait for just about any saltwater fish because they're shiny, and active on the hook. Mullet, herring, pilchards, threadfin and pinfish are relatively easy to find, and are some of the best bait for saltwater fishing to catch and use. To be a successful saltwater fishermen, you need to know where to find the good bait for fishing, and then know how to bring them in. One effective fishing tip is to watch the birds. They'll give you a pretty good idea of where the bait fish are, and how deep they're swimming. If you see seabirds circling the area, or pelicans and terns diving, you'll know there's live fish bait in the vicinity. If the birds are repeatedly going in after the fishing bait, the fish are on top. If they're going in sporadically, the fish are deep. Fishing bait can be found in a number of places. You'll find them schooling in the open water, and if they're jumping, larger game fish are chasing them. 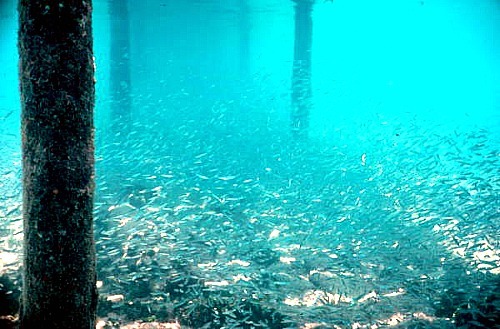 Bait fish also like to congregate under piers, bridges and towers, and around structure such as reefs and shipwrecks. There are a variety of ways you catch bait fish. Almost as many ways as there are types of bait fish. If you're not familiar with what some of the more popular bait fish look like, this is an interesting site that provides a good description of some of the different bait fish you can use when Florida Keys fishing. Knowing where bait fish typically congregate, and knowing how to identify them is important. Now you just need to know how to catch bait fish. Chumming for the fishing bait is easy and effective. Chumming brings some of the bait fish to the surface so you can use a cast net to catch and store them in your live wells. Cast nets work well for catching shrimp as well, which are a popular fishing bait for inshore fishing. A quick easy fix for chum is to use large cans of cheap, stinky wet cat food. It keeps well, it's easy to find, and is relatively inexpensive. However, making your own chum mix can produce even better results. Even if you're on a Florida Keys vacation with limited resources, it's easy to make and you'll be pleased with the results. This chum recipe whips up in relatively no time. Start with a large 5 gallon pail, crumble up 10 old loaves of white bread, add 10 large cans of cheap, smelly fish flavored cat food. Add 1 gallon of smelly fish attracting menhaden oil, then throw in chunks of fish with a strong odor like sardines and mullet. If you have the ability to cook or microwave some food, try to include cooked rice, even pieces of cooked pasta. You can also throw in a couple cans of corn or use a bag of frozen corn that's thawed. Once you've added all your ingredients, fully blend the chum mix together. When you use your chum mix, the menhaden oil will create an oil slick on the top of the water, making it easy to identify the area you've already worked. Some of the chum will float, and some of your homemade chum will sink. The effectiveness of this process means that you're targeting different species of saltwater bait fish at various depth levels, increasing your odds of catching good fish bait. If it's not possible to make your own chum, and you can't or don't want to buy the chum, you can use just menhaden oil. This oil is known as a highly effective, strong fish attractant. However, if you use just the menhaden oil without the chum, you'll end up with just an oil slick on the surface. The oil won't be able to sink down, filtering through the layers of water attracting fish at different depths. The oil will have to draw the fishing bait to the surface, but since it's so strong smelling and enticing, that still means you should see plenty of saltwater fishing bait come to the surface. 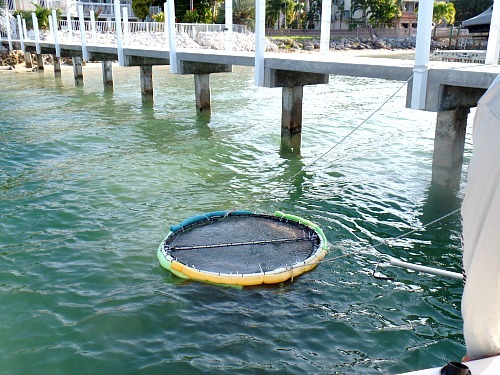 Another way to catch good bait for fishing is to use pinfish traps or other bait fish traps. This lets you capture larger quantities of fishing bait once you've located them. Traps are considered easier to use and since you don't have to use chum, you'll find your boat stays cleaner. Using bait traps also means you don't have to deal with the occasional difficulties that come with handling a casting net. When casting with a net, there's one advisory caution that should be heeded. It's not uncommon for a casting net to catch a strong current. Often fishermen don't want to let go and loose their net. However, by hanging on to your net you could seriously injure, even loose your arm in the process. One of the better fishing safety tips you'll get is to remind you tie your casting net to your boat. That way if it does catch the current you won't loose your net or your arm in the process. Unfortunately many saltwater fishermen don't know this important safety tip, and the ocean is riddled with lost nets. They're hung up on shipwrecks and reefs and are a serious threat to fish, sea turtles, and other marine life. These lost nets also pose a serious problem for anyone scuba diving Florida Keys, as they can get caught and hung up in the netting. 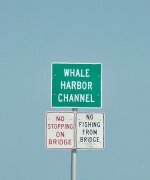 This link to the Florida Fish and Wildlife Conservation Commission section on net restrictions will give you additional information so you can ensure you're compliant with Florida fishing regulations. Once you've caught your bait for saltwater fishing, you want to keep it alive and in good condition. To do so, minimal handling is best. It's also critical that you get your bait fish into the live wells as quickly as possible. When Florida Keys fishing, you should also make sure that your rental boat has at least several large bait wells. Fish live wells are supposed to keep your fish bait alive long enough so you can use them. The problem is, most live wells are too small. If you can have at least 2 live bait wells then you'll be in better shape. If your Florida boat rental doesn't have a live well, you can purchase the portable live wells that are available at bait shops, marinas and other places throughout the Florida Keys. These portable live wells are small, but if nothing else they'll let you transport the bait fish you're going to use that day. 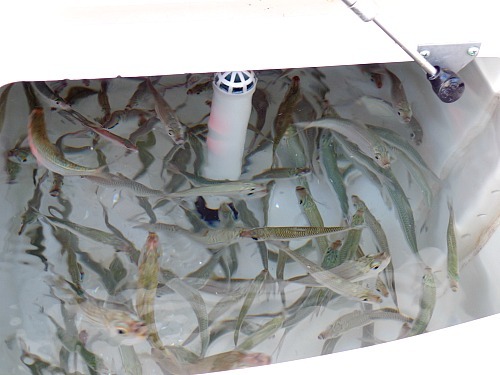 Make sure you buy enough portable wells to comfortably and safely transport the number of bait fish you're bringing along. For bait fish to survive, they need to have enough oxygen which is why an air pump system to keep the water aerated is important. If the fish live wells are small they'll use up the oxygen too fast. Fish also need some light - not necessarily too much light, or the water will heat up and kill the bait fish. The right temperature, the right amount of light and ample oxygen are key to your bait fish staying alive. And the health of your fishing bait is your key to success when fishing Florida Keys for the trophy saltwater fish. Florida Keys fishing tips also include monitoring the overall health of your bait fish. To ensure your success, you need to make sure your bait stays in tact - scales and all. If your fishing bait ends up loosing some of their scales, they become weaker. Weaker bait fish aren't as exciting, they don't draw the attention you need to attract the big saltwater fish, and of course, they won't live as long on the hook. Also, white spots are left on their bodies where the scales were, and these markings are visible under water. 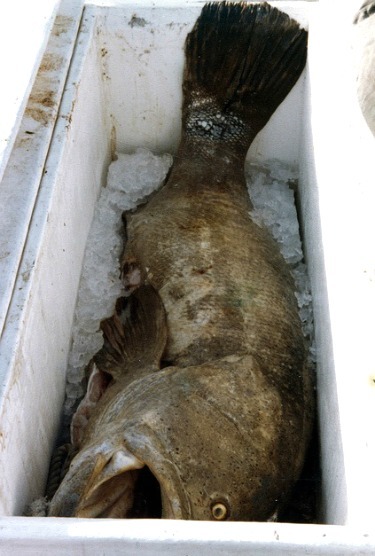 They no longer become the attractive meal they once were, and this can diminish your chances for saltwater fishing success. Over handling live bait is a big problem for some fishermen. Not only can the bait fish become damaged, they'll end up with more of your scent on them - worse if you have sunscreen on your hands. This is one of the most important Florida Keys fishing tips to remember - avoid over handling your bait. Overall, fishing bait are a good addition to your fishing arsenal but if you find that you really don't know what bait fish to catch, or where the best places are to catch them, you can do 1 of 2 things. Go down to one of the local bait shops and ask them where to go and what to catch. If that ends up seeming like more work than fun, then at least you're in the right place to buy some fishing bait. Then head out on your Florida keys fishing vacation and catch some trophy saltwater fish.